2017 was an uneven year for me. It began with me fearing a US stock market collapse as interest rates went up. Then I looked forward to the Tories increasing their majority so they could push through a hard Brexit. I was pretty down after the election, and I was then distracted by putting together the AIM IHT Portfolio. So it wasn’t until the fourth quarter that my own portfolios received the attention they deserved. Since then I have been busy with tidying up. That said, 2017 was an easy year to make money, and not a bad one in which to largely ignore my stocks. Every significant index went up. 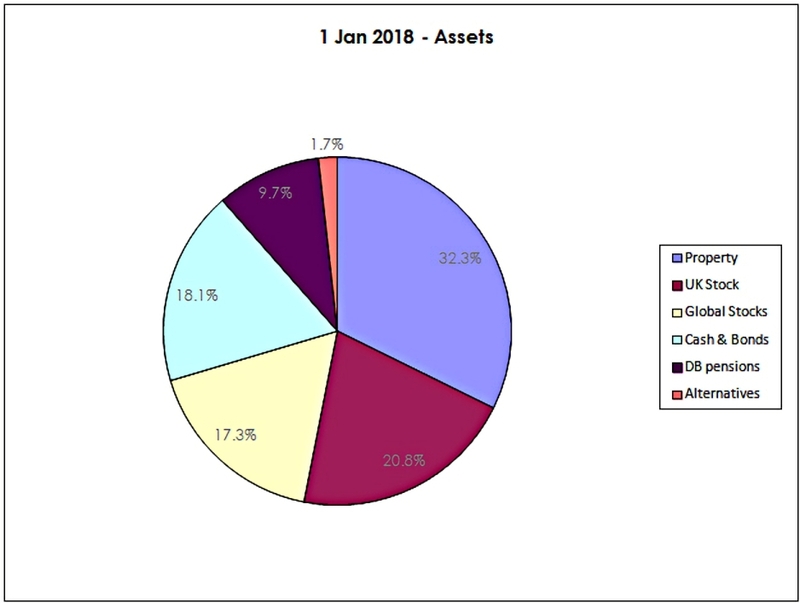 If you already had a good asset allocation strategy (which included global diversification), you would have done ok.
My overall portfolio is up 11.1% for 2017, which is 2.4% above its benchmark (which delivered 8.7%). Unlike many bloggers and twitterati, I use a “total wealth” approach to my portfolio. This is primarily so that I maintain a high enough allocation to equities as I get older. The “stocks plus cash” portion of my portfolio (excluding property and DB pensions – I don’t hold any bonds), which is what most people report on, is up 16.7% after allowing for net cash withdrawals. This compares to a global stocks benchmark (including dividends) of 11.7%, so we are up by 5%. I can’t spend anything remotely near 11% of my portfolio in a year (1% is more like it) and so this has been another good year. 11% is also several times more than I ever earned in a year by working for somebody else. 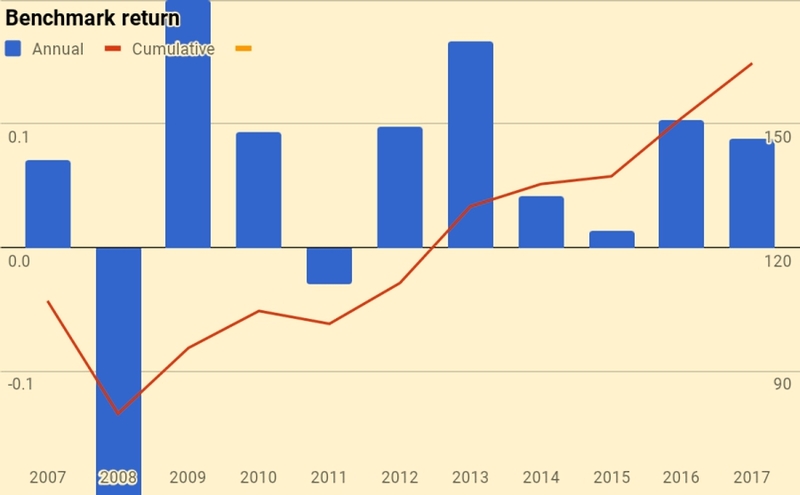 And it’s the second largest annual return in absolute terms in the eleven years since I started tracking things in detail. Because of high prices in London, I own more property than I would like, and that asset class underperformed once more. I’m also overweight in cash, as I’m worried about Corbyn, a global crash and Brexit (in that order). I will compensate for this in 2018 with more leveraged positions (spread bets) using trailing stop-losses. Against these headwinds, I finally got around to revaluing our DB pensions. The new methodologies (plus the passage of time) resulted in a significant uplift in this area. Rather than use UK currency, 2006 is baselined at 100, so that the portfolio is now worth 298. 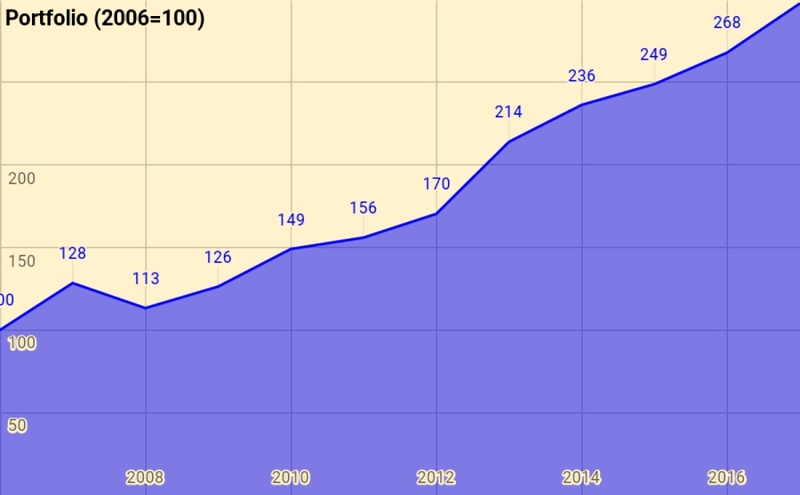 Thus total growth over 11 years is 198%, or 10.4% pa. This is acceptable given that it includes the 2007 financial crisis, and nine years of low interest rates. The weights come from allocating a target percentage to property and cash – intended to be average for a UK private investor aiming to reach financial independence – and dividing the remainder between UK stocks and international stocks. I exclude bonds because I don’t hold any at the moment. I’ve long been waiting for the bond market to crash before I buy. I use a higher than normal cash balance instead. The benchmark had a decent year – it was up 8.7%. 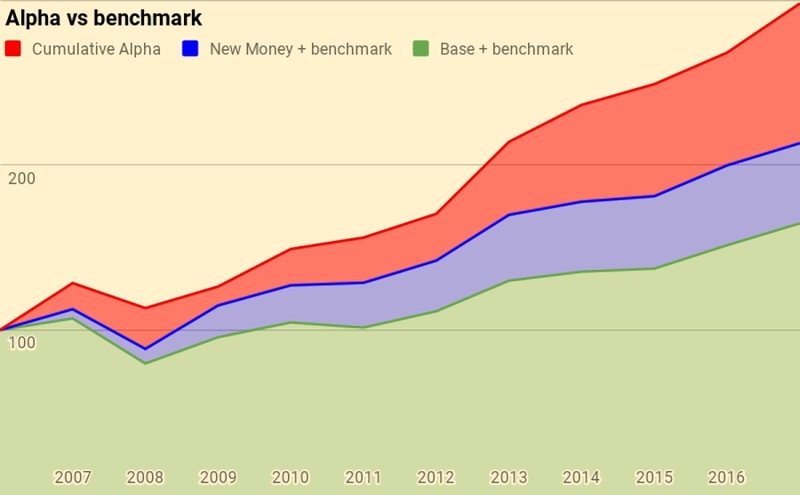 Over 11 years the benchmark is up 64.7%, or 4.6% pa. 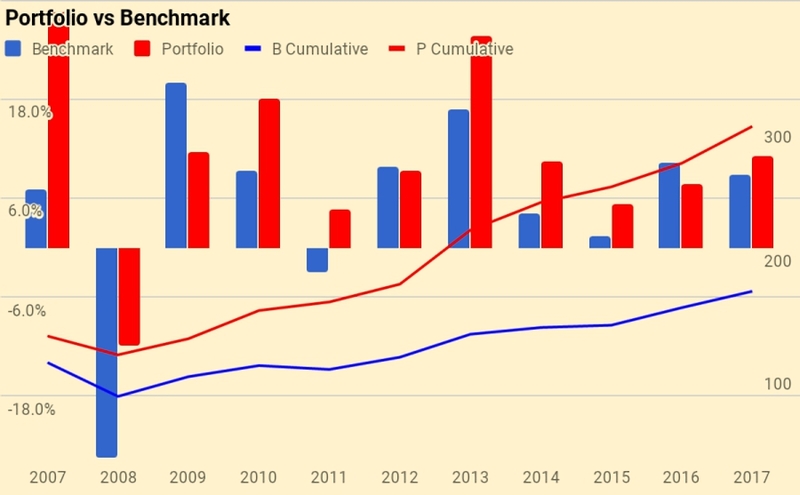 So my portfolio has on average outperformed by 5.8% pa (in nominal terms – see also the more detailed analysis below). 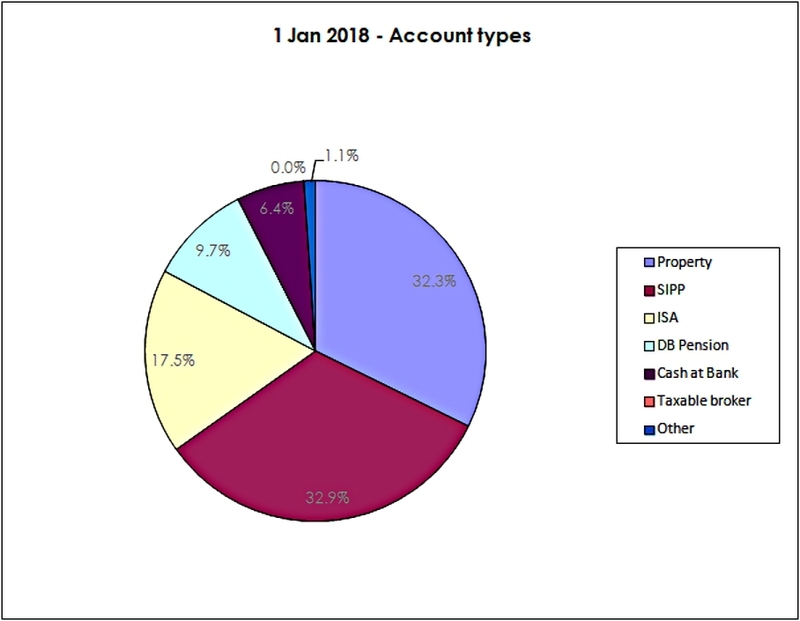 Apart from the 32.3% in property, another 32.9% is in SIPPs and 17.5% is in ISAs. That’s 83% of the total accounted for. 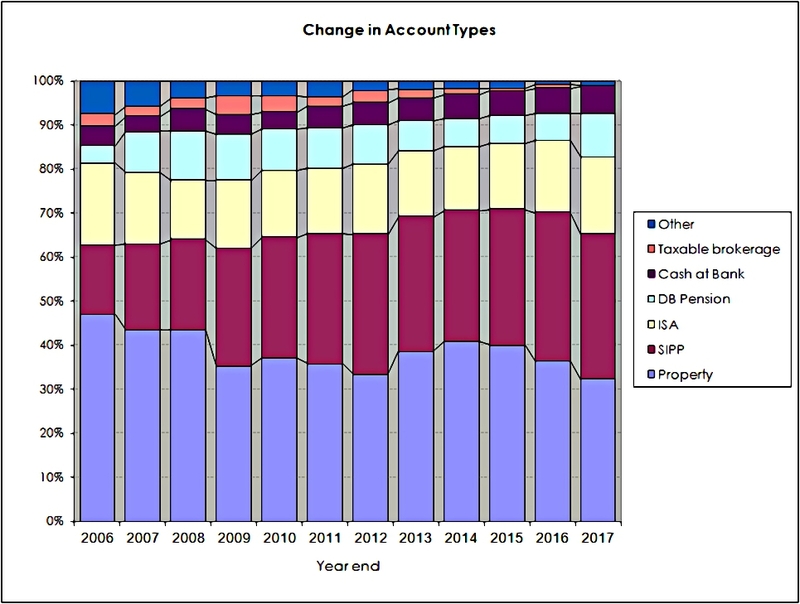 The remainder is split between DB pensions (9.7%), Cash (outside tax shelters – mostly a large personal loan – at 6.4%) and other potentially taxable accounts (1.1%). 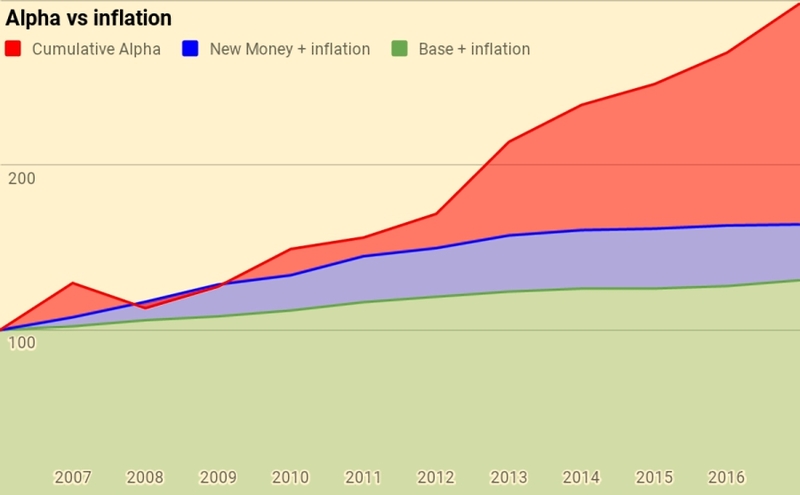 Let’s look at new money first. 2017 was the first net negative year, as I made two large withdrawals from my SIPP in order to fund living expenses. 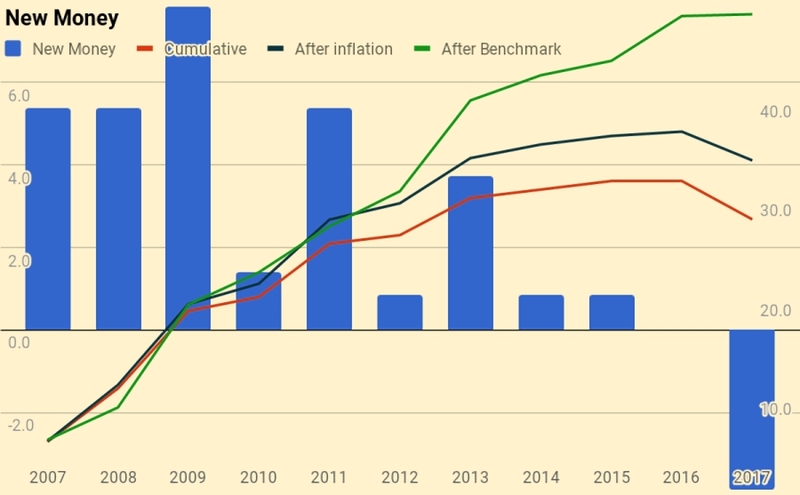 The chart also shows a cumulative total for the entire period (the red line), and then increases this to reflect inflation (blue line) and benchmark growth (green line). New money totals 27.8 of the total portfolio’s value of 298. After inflation this rises to 33.8. After benchmark growth, it rises to 48.6. 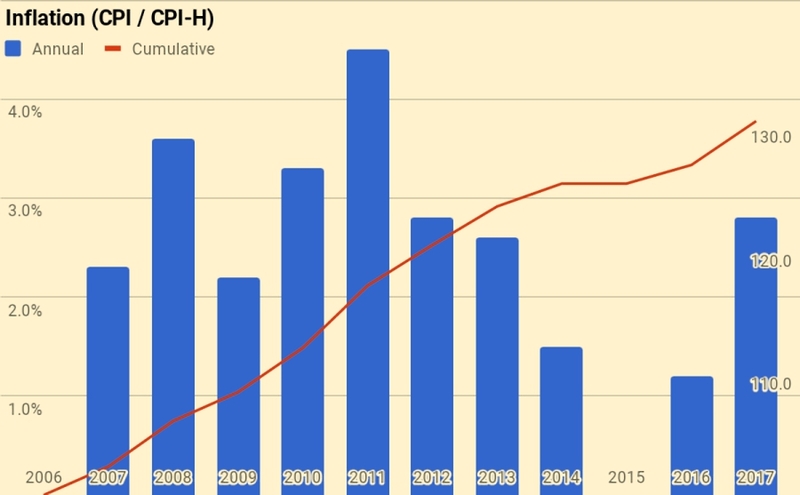 Since I am an owner-occupier, I have switched from CPI to the newly-introduced CPI-H.
Total inflation has been 30.2%, or 2.4% pa.
Over ten years the benchmark is up 65%, or 4.6% pa. I looked into adding counterparty analysis this year, but I realised that this would enable readers to translate from my percentage reporting into UK currency. If you want to say this is reliant on the Land Registry, you could say that the UK government is my largest counterparty. This is higher than I would like and I will be reducing. This is down from 11% in 2016 and I expect it to fall further. Fifth is a personal loan at 6%. New this year are PensionBee and NEST. I also thought about adding turnover analysis, but decided that it would be misleading. During 4Q17 I began to restructure and simplify my accounts. I do this rarely, and prefer it to take place when markets are high and potentially over stretched. That way, if there is a crash while an account that I am moving is in cash, I can buy back at lower prices. This process will complete during 2018, and I will think about looking at turnover seriously for 2019. Quite a strange pattern, and a total of 174 trades for the year. This doesn’t include a lot of legacy OIEC sales. I expect we might beat that in 2018. This doesn’t quite represent turnover, since my position size varies, and I haven’t declared an average position size relative to portfolio size. Also, some of these trades were for setting up the AIM IHT portfolio, which shouldn’t count towards my turnover. In absolute terms this has been a good year (2nd best out of the last eleven). That said, it’s an acceptable result. At my stage of life and with my size of portfolio, capital preservation is important and rapid growth less so. 11.1% growth is way ahead of inflation and my spending patterns, and comfortably ahead of my personal benchmark. I’m also worried that London property could continue to reverse, though without serious inflation and higher interest rates, the decline should be gradual. I expect to be more active in 2018, as I think the risks to a global passive portfolio are increasing. The Bonkers (Momentum) portfolio is also back on its feet via spread bets. 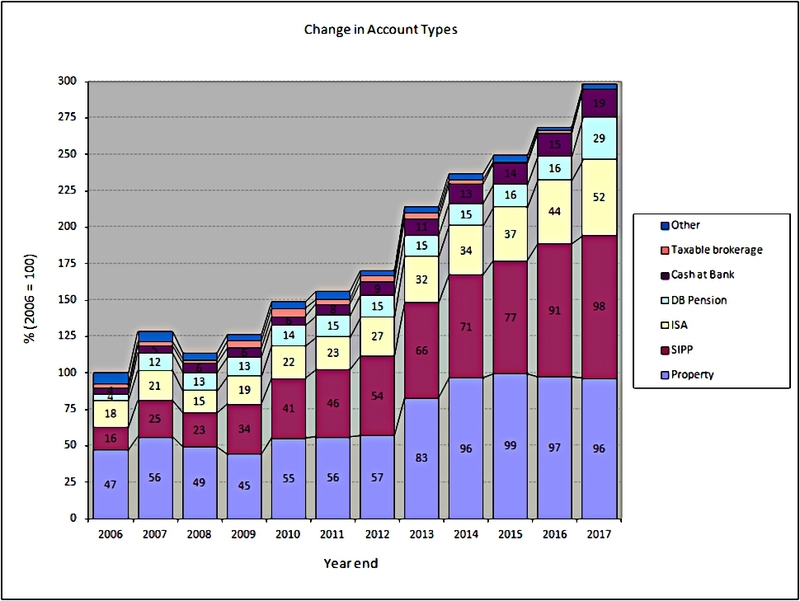 A defensive, “protection” portfolio – see this post for more details. This will probably begin as spread bets and migrate into ETFs once it has proven itself (and I can free up some capital). I also want to do something about my passive investments – the ETFs and Investment Trusts. These are working fine, but there are just too many of them. Between the ETF, IT and Exposure Stocks lists, I have more than 300 entries. As a starting point for 2018, I’d like to get that down to a central list of 100, and focus my passive investments around them. That’s it for today – let me know what you think. Mike- your portfolio has done very well and I congratulate you on that but I would be worried that you have no fixed income in terms of bonds or gilts as part of your strategy. You appear to be waiting for timing rather than time to buy into them, when one of the lessons the markets have taught me over the last 30 years or so I have been investing, is that bonds/gilts are valuble insurance. Just as an example, take the financial crisis of 2008. The worst performing UK Growth fund in that year lost over 62% whilst the worst performing Gilt fund returned +3%! The best Gilt fund that year returned 13% compared to the best UK Growth funding recording a loss of 15%. In those turbulent times they were a very good counterbalance. Even in recent times Bonds/Gilts have performed extremely well despite people always calling the bottom of the market – the best performing Bond fund/trust returned in 2017 over 12% (pretty much what the FTSE returned) and close to 50% over the last 5 years. Even the interest rate rise towards the end of the year did not stop some funds/trusts registering double digit returns. 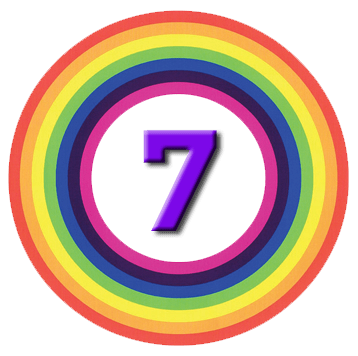 My portfolio returned 9.6% which meets my target (+7%) and I had 50% invested in Gilts/Bonds and they have given me great protection during the very lean times and moderate upside in the sunny days…. At the moment bonds offer risk with no return, so I won’t be buying any. I keep many years of cash for living expenses, so I don’t expect to sell stocks when they are down. And I have a feeling that when stocks go down this time, so will most bonds. I’ll be interested in high quality bonds if / when they yield 4% or more. I would argue that if HY Bonds are giving a total return of around 12/13% (which they are at present) then that is return with risk rather than being risk with no return. It is also historically the case that when stocks go down big time that the two assets who nearly always do well in that situation are the two ‘Gs’ -Gold and Gilts. The last financial crisis is ample proof of that – the best gilt fund returned +13% and the best growth fund lost you 15% -that is exactly how I would expect gilts and stocks to work together – inopposite directions, thankfully! Corporate Bonds and HY Bonds will go down in that scenario as there is a linkage to stocks of course but when the usual stuff hits the fan, investors go for safety and there is no asset more secure than UK Gilts and the Gold price. 2 – the bonds that might not go down down in the crash (I say they will) offer a miserable return. The next crash won’t be like 2008 as yields and interest rates are too low. I think in a crash, there is no asset more secure than cash (unless you expect the UK to default on sterling). I don’t think I’m alone in saying bonds are terrible value right now. But the bonds are there for insurance purposes not to beat stocks . If cash was the most secure asset you would expect investors to flock to it in times of stress but historically they don’t – they go to Gold and Gilts instead. 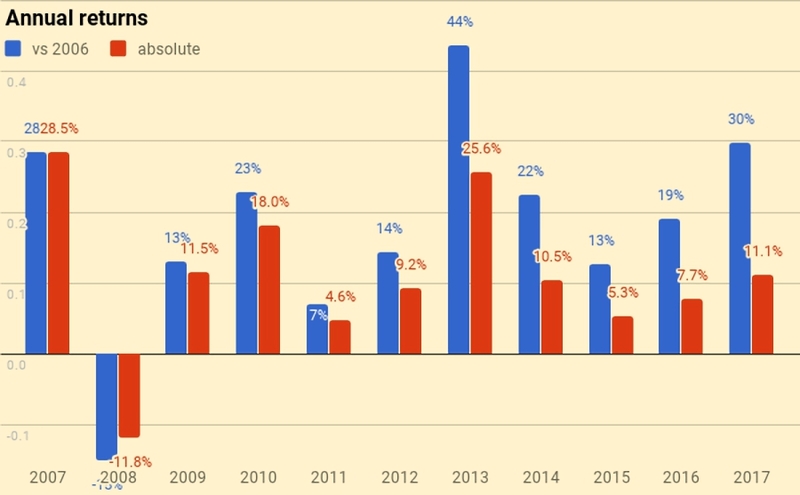 You are not the only one to say bonds are bad value but people have been saying that for the best part of the last 5 years – during that period, bond funds have delivered 10% per year over that half decade. Just because people say bonds are terrible value does not make them right of course……. Hey Brian, all I can say is we all put our money where our mouth is. You buy bonds if you want to, I’m not going to. I can spend cash at Tesco’s- that’s why I prefer it to bonds and gold. And with enough cash ( I currently have 17 years worth) I can wait out any downturn in the stock market – so I don’t need “insurance”. The past is not the future. I firmly believe that there will be no flocking in the next crash. The only people buying bonds are institutions and pension funds that are required to do so. 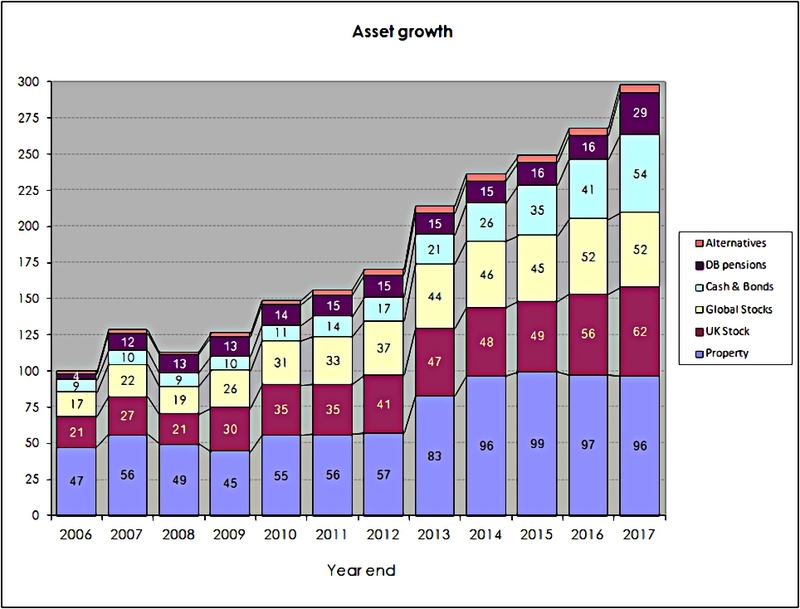 Mike- in fact it is not the case as you suggest that only institutions and pension funds are buying bonds – the biggest inflows of retail money in 2017 was to bond funds (there were net sales of over £1bn)- inflows to stocks was just £0.8bn). 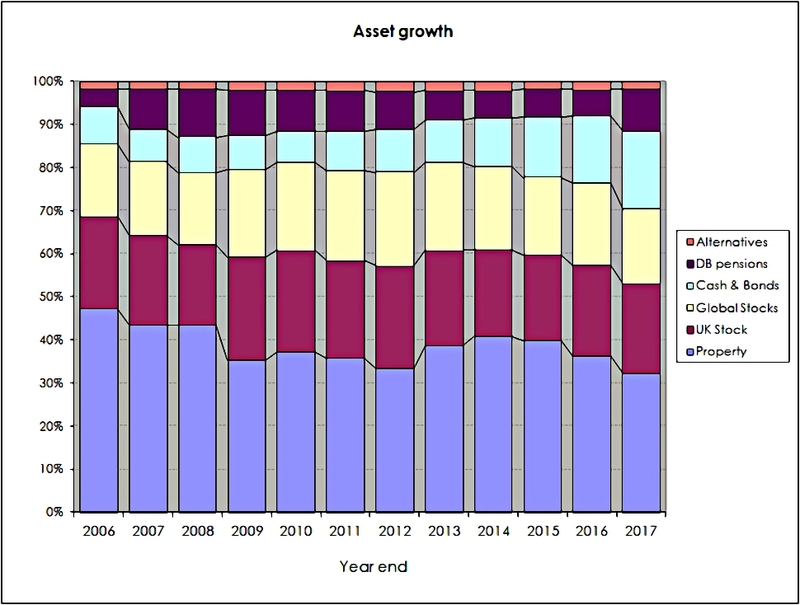 Investment Week wrote on the subject “There were positive retail inflows across all asset classes except Money Markets, which saw its first outflow since January 2016. Fixed income funds proved to be most popular with a net retail inflow of £1bn. [The] Sterling Corporate Bond was the second best-selling sector with £432m of net retail sales”. In short private investors are buying bond funds in significant numbers -you may not agree with it -but it is happening! It’s not the first time I’ve been guilty of assuming that everyone else is as rational as me. Good luck with the bonds – I’m off to buy more crtypto. Mike, But surely it is the person with no bonds who is acting irrationally? Interestingly enough in last week’s Investors Chronicle Chris Dillow was asked to comment on this issue with a reader who wanted a balanced portfolio and Dillow made the point that you hold bonds as an insurance against a stocks down turn (the main point I was making really) and with Index Linked Gilts you cover yourself against inflation to boot! You only have to go back to that great investment primer The Four Pillars of Investing by Bernstein who showed the value of holding bonds when he looked at the returns of stocks and bonds over the last 100 years. If you did not hold any bonds you would have lost in the century’s worst bear market 42% of your investment whilst if you just held bonds you would not have incurred any loss -in fact you would have gained 15% during that period. Pretty much identical to what happened in 2008- which surely says that this behaviour of flight to survival is not a fluke but is in the DNA of investors and they will continue to act that way in the future-what other conclusion can you reach? Indeed a no bonds portfoio returned just 10% a year during that 100 year period against 9% when you held 25% bonds. Not a huge difference overall but you avoid seeing such a huge loss in bad times. My point is that most people do not have 17 years income or expenditure in cash and they do need insurance which is Dillow’s, Bernsteins’s and my point. Hi Brian. This is getting boring. You say bonds, I say no bonds. Chris Dillow would tell you to vote Labour, so I would argue that he is not infallible. I am not saying that holding bonds in the past was wrong – I am saying that holding bonds now is wrong. Only time will tell – an old book can’t prove me wrong. I’m going to draw a line under this one. Please don’t add another comment saying we should have bonds.